Jean Daniel Colladon was born December 15,1802 in Geneva, Switzerland. One of his greatest acomplishments was in ultrasound sonography. He studied law, but was more interested in math and science. The physics of water and light intrigued him. He spent the rest of his life in the persuit of natural phenomena. In 1826, Colladon used a church bell under water to prove that sound traveled faster through water than air. 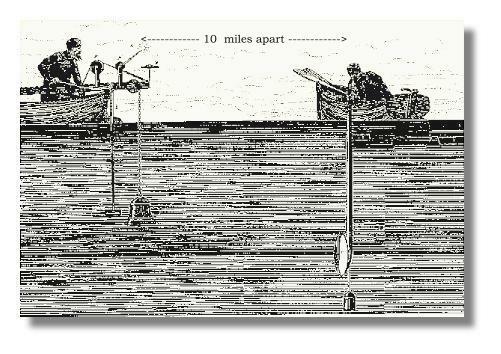 In lake Geneva, assisted by Charles-Francois Sturm, a mathematician, the two split apart by ten miles in boats. One struck the bell underwater and ignited gunpowder above the surface at the same time. With the other positioned Ten miles away, they started timing at the flash of the gunpowder and stopped the timer when the sound arrived later, using a trumpet-like instrument. A crude ultrasound amplifier. Related topic The Doppler effect Despite their simple devices, They calculated the speed of sound underwater at 1435 meters/second. See ultrasound A number that is close to today's known standard. It has evolved into its own science and even though Colladon used a simple ultrasound amplifier, he paved the way for the transducer.